Saudi Arabia, June 6, 2018: In line with its innovative innovations and continuous efforts to meet the needs and desires of its customers, Al- Jazeera Paints has launched two tiles products in its distinguished group of high quality cement products, offering its customers strong and robust products to install tiles and solve the problems facing its users and implementers. In this context, Al-Jazeera paints has launched the porcelain adhesive 'Al-Jazeera Santex', a high-performance, strong adhesion and highly productive product. It is suitable for vertical and horizontal applications as well and can be used with marble, swimming pools tiles and other non-porous tiles. Also, it can be applied on floors making it reduces cost and effort. For ceramic & mosaic, the company has introduced 'Al- Jazeera Tilex' product, a high quality and performance adhesive as well, which is used to install tiles, ceramics and mosaics of all kinds for walls and floors, as well as terrazzo tiles, allocated for floors. The two products are made of carefully selected raw materials, which represent a quantum leap in modern technology to enhance adhesion ability, improve the performance and workability and curing all adhesive problems that the customers used to face in the past in terms of instability and adhesion, both of which can be used for floors and walls in the interior and exterior surfaces to install tiles from top to bottom without using pegs of joints, they are characterized by strong bonding, resistance to slip and suitable for the atmosphere of the Middle East. 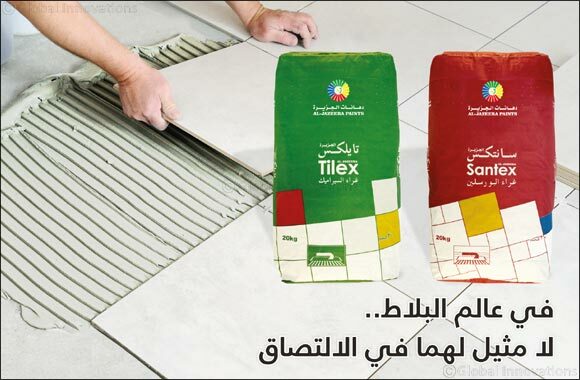 'Al- Jazeera Santex ' and ' Al- Jazeera Tilex' have been admired by many constructions’ owners and tiles implementers as a highly valued addition in the construction field, as they are useful in remedying many tile fixing problems and reducing the time and effort of tile implementers in terms of ease of mixing, application and modification ability. During the last period, Al -Jazeera Paints has provided technical and training support to tiles implementers and sellers in the tiles showrooms and building materials shops in all regions of the Kingdom, in order to ensure the accuracy and professionalism of the products to benefit from their full advantages. The two products are displayed at Al-Jazeera paints branches, building materials shops and tiles sales showrooms throughout the Kingdom. It is worth mentioning that Al-Jazeera Paints has allocated advanced production lines for its cement products, with a production capacity of 50 tons per hour, on an area of 48 thousand square meters in the industrial city of Sudair, Riyadh.